No matter what season it is, patios are an essential part of any outdoor setup. 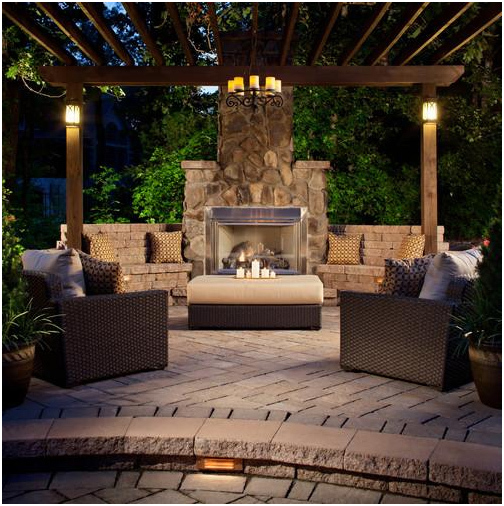 Design a great one for a sunny day with the kids, or for relaxing with friends by a fire pit. Here are 5 beautiful patios to draw inspiration from. 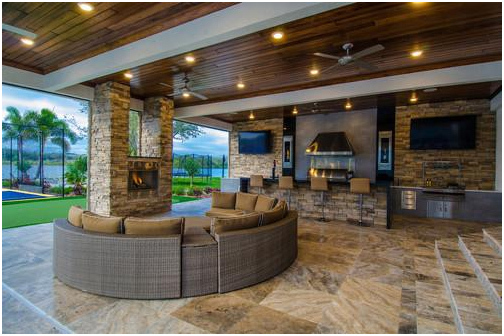 Laid out in beautiful brick and stone work, this patio really has it all. It’s the perfect place for to hold that Labor Day barbecue or celebrate your favorite team’s latest victory. The layout of the grill, oven, and counter tops make this a streamline system for cooking food for the masses. Plus in the winter, you can cozy up in front of the fire to warm up between playing in the snow. Bring on the romance with beautiful trailing vines which give an open air effect while still providing shade and privacy. The fireplace becomes the central point with the seating curling around it, making it a cozy and intimate setting. Mix up the textures by bringing in some wicker furniture. 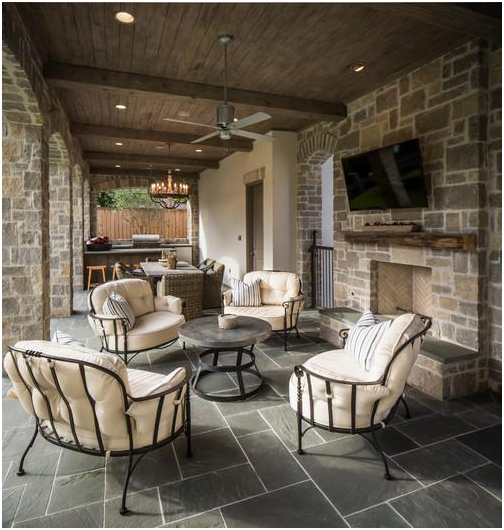 For the dog days of summer, a ceiling fan comes in handy in this cool patio. It’s the perfect place to sip lemonade or as the bar off to the side implies, margaritas. With both a dining and a lounge side, this patio functions as a great outdoor dining room as well as a cool place to hang out in front of the TV in those ultra plush chairs. The stone next to the wood gives it a stylish contemporary look while keeping it classic. With the smooth lines that make up the core of mid-century style, this patio is stunningly awesome. The wood panel housing for the grill is genius, not only does it provide a shield for your grill from the elements, but it also provides shade while you stand over it to slow cook your pork chops to perfection. Another really great touch is the lattice designs on the on the ceiling which adds a sense of artistry with the rest of the furnishings being solids. 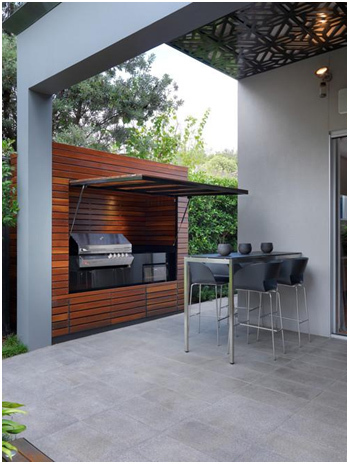 Think of this not only as a patio, but also as an extension to your kitchen. 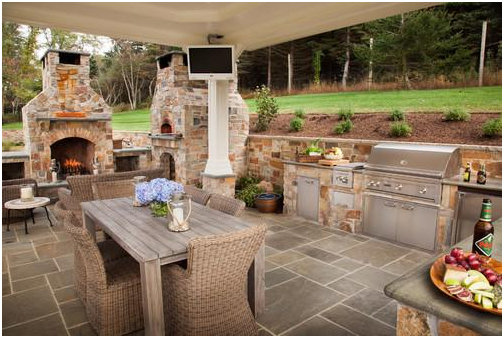 This is the perfect space to host a cookout. Serve up your favorite recipe from behind a bar with no concerns about people getting in the way. Enjoy some great lighting that bounces beautifully off the polished marble floor. There’s the plus of having a fireplace for people to gather around to roast marshmallows or TVs to catch the game, all while having the ability to cook without being shut away in the kitchen. This is a guest post by Tim Smith of Modernize.com. For more inspiration on designs for your backyard, check out Modernize.com.